➤ Upon arrival at Ngurah Rai International Airport, meet & greet by local representative. Lunch served at local restaurant. proceed to the cliff top of Uluwatu, the inner sanctum of the pura is perched majestically on the edge of a steep cliff that towers above the legendary surf breaks of southern Bali.Continue to visit One of world’s biggest statues, Garuda Wisnu Kencana, is currently under construction in Bali, and it’s already looking impressive. Slated for completion in September 2018, the gigantic monument of the Hindu God of providence Wisnu riding the mythical bird Garuda will be around 120m high (including a concrete pedestal) and 64m wide. Enjoy Kecak Dance at this park is that the accompanying music is provided by the human voice, the gamelan suara, a choir of a men or more sitting in concentric circles, and also other dance at this park. ➤ Grilled Seafood Dinner at Jimbaran Bay. Drop off at hotel for check in and free at own leisure. ➤ After Breakfast at Hotel,proceed to visit Celuk & Mas Art Village, Balinese professional, artistic and skillful of design development related to the silver & gold crafting and wooden carving; proceed to Traditional art Market of Sukawati. next visit is Tirta Empul Temple/ Tampak Siring, was built around the springs and special bathing-pools. In the inner courtyard there is clear slate-blue spring water bubbling up into it’s own enclosed rectangular pool through a sedimentary layer of black sand. In Balinese legend this spring water was created by Indra God when he fighted with the Mayadenawa King. 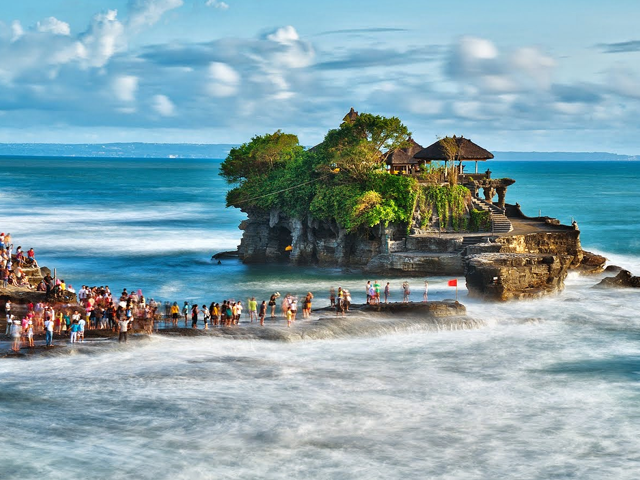 This place now very crowded with the people when the secret day for bathing special ritual called in Balinese “melukat” purefication ceremony. ➤ Buffet Lunch at Kintamani, Where you can enjoy the spectacular view of the still active volcano with lake batur. next visit to Bali coffee plantation, Kopi luwak, or civet coffee, is one of the world's most expensive and low-production varieties of coffee. It is made from the beans of coffee berries which have been eaten by the Asian Palm Civet (Paradoxurus hermaphroditus) and other related civets. pass by Tegalalang Rice Terrace, and Proceed to Ubud Palace, is an Ubud Kingdom Palace with beautiful Balinese traditional houses as a residence of Ubud King. It is set in the center of Ubud Bali with traditional art market just in front of it; Ubud Traditional Market, the art crafting are sold in this art market consisted of various crafting, from traditional until contemporary crafting which its price is relatively cheap. ➤ After Breakfast, prepare to visit Taman Ayun Royal Temple is beautiful temple in Mengwi regency, an impressive complex stands on an island in a river, its inner temple surrounded by a moat. we continue to visit Candi Kuning Traditional Market, where fresh fruits and vegetables display on sale. Then continue to Bedugul area to see the remarkable view of Beratan Lake Temple/Ulun Danu Beratan Temple, is dedicated to Dewi Danu, the lake goddess. The sight and cool atmosphere of the Bali uplands have made the lake and this temple a favourite sightseeing and recreational spot as well as a frequently photographed site. ➤ After breakfast, free at own leisure until time to check out. ➤ You will then be transferred to airport for your return flight home.